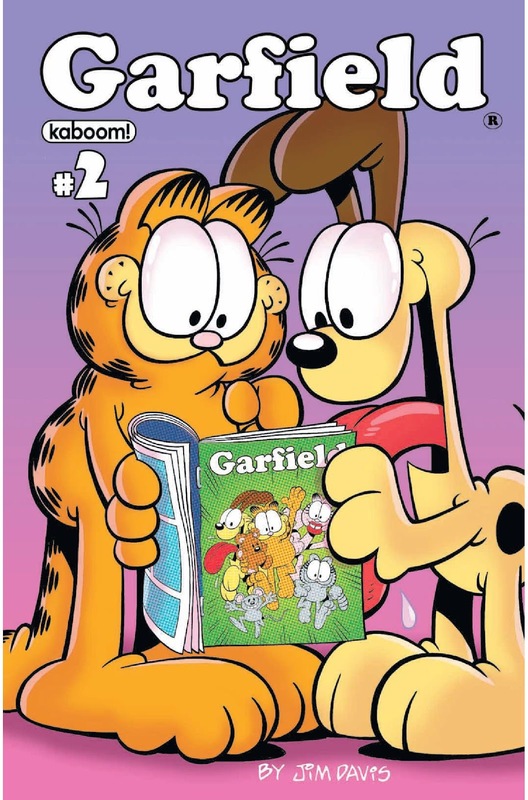 The Fellowship was fortunate enough to obtain a copy of GARFIELD #2 from KaBoom studios. The stories are by Mark Evanier with art by Gary Barker and Dan Davis. In “Sticking Point,” Odie mistakes a power rod from a crashed alien ship as a stick that Garfield threw just to get him away. When Garfield discovers that the rod grants him any of his wishes….including 20, no…50 pizzas, he feels he has it made. That is until he realizes the alien might want it back or destroy it if he can’t have it. In “Down for the Count,” Garfield is being chased by a hot dog vendor who he stole from. The chase disrupts other citizens which leads them to join in. Meanwhile, John is trying to count the number of jelly beans that is in a jar to win $500, only to get interrupted and lose count time and time again. This book was a fun read that anyone who needs a laugh can enjoy. I can hear the late Lorenzo Music’s voice when I read Garfield’s thoughts. Mark Evanier’s stories are humorous and well done, but that’s no surprise. Mr. Evanier was a writer for both of the animated series, so he knows these characters well. Very entertaining book. GARFIELD #2 is in comic stores now and at www.kaboom-studios.com.